This clam chowder can be a main course soup. It is one of our easy dinner recipes and just needs a side salad and a roll to become a delicious lunch or light supper recipe. I think you will love the rich, creamy taste. Peel the onions and sauté them in butter, or with the bacon, on medium-low heat for about 15 to 20 minutes, until they are golden but not brown. Cube the potatoes and add them to the onions. Sauté 10 minutes, stirring often so the potatoes don't stick. Add the water, bay leaf, thyme, and salt. Chop the celery and add it. Simmer 10 minutes, uncovered, until almost all the water has boiled away. Add the clams with their liquid, cream and pepper and bring back to the boil. Remove from heat. Sprinkle generously with paprika or more pepper and serve. Use fresh shucked oysters instead of clams, and turn this into oyster stew. There are two types of clam chowder recipes. 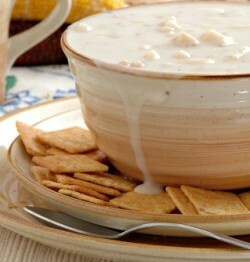 This recipe is a New England clam chowder, which contains cream. It is the chowder we most often think of. The other type of chowder is called “Manhattan” and uses tomatoes instead of cream. I think you will really like this recipe. It will make you feel like you are on the shores of a Martha’s Vineyard beach. 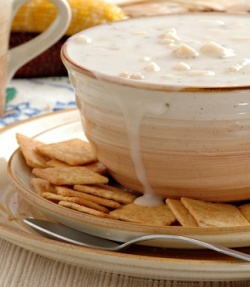 This clam chowder recipe is just one of our amazing, tummy warming soup recipes. 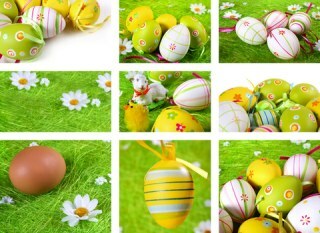 Find the entire collection here.